Dawson Public Power District General Manager Gwen Kautz. As I look back over the year, and like most years before that, it sure seemed to go by quickly. I believe that’s how older people often view time…whizzing by. Ask a youngster and they will tell you how many days it is before their next birthday, or Christmas or a school event. They believe time drags on and on because they measure time differently from older generations. Their perspective will change as their age changes. Mine did. Dawson PPD’s 2018 look-back showed that the wet summer significantly lowered energy sales for irrigation. The upside to that is that our farmers spent less on power. While those lower sales messed up our budget, it was an opportunity to see what kind of adjustments could be made to counter that. The answer: not much. You see, our year is often scheduled way in advance by securing contracts for different things like construction and material. These are things we cannot change. 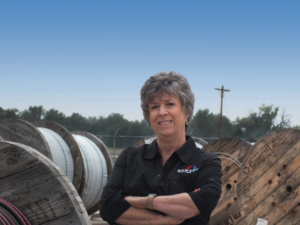 The directors spent several months looking at how our rates were structured in relationship to how we are billed by our wholesale provider, Nebraska Public Power District. It showed that some adjustments would be necessary in 2019. Our intent is that no one rate class subsidizes another. We understand that you don’t want to pay for something you do not use or have control over. We’ll be making some rate adjustments in the spring of 2019 that will result in a fairer way of billing. Before those rates are changed, a team of employees will reach out to those customers who may be affected negatively. An evaluation, customized to the customer’s account, can be done to see if changes can be made to mitigate the increase. A highlight for me was sending an invitation for customers to meet with us on July 31. We intended to host just 16 people, but the response was overwhelming, so we adjusted the number to 30. All in all, we had 24 customers spend the day with us. We showed them how poles are climbed and set, and what equipment is needed and used. We spoke specifically about safety and, in general, they got to look at our wide-ranging work to see why we do what we do, and when. We showed them our history and they glimpsed into our future. Some customers came in with issues they wanted addressed and we did that, too. It was a successful and amazing day for us. All in all, this year we made some easy decisions and we made some very difficult ones. I keep hoping that 2019 will be uneventful – but I’ve hoped for that every year with no luck. Every year seems to unfold differently with new challenges and new opportunities to serve you better. I’m sure 2019 will not be any different. As you look back on your own year, I hope you do what I do – have a grateful heart for all the things that went smoothly – and use the things that did not by embracing what you learned. May the spirit of Christmas fill your home with family, friends and warm blessings; remembering that the birth of our Savior brought new hope to all. 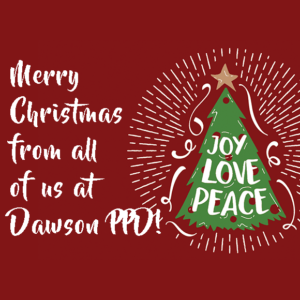 Merry Christmas from all of us at Dawson PPD!